Reflect on the coming course – what will be needed? Understand the structure of the course, and how the lessons will be divided. Complete the preparatory google form. Reflect on the current understanding of Computer Science, and what will be needed over the coming months. Join Google Classroom. Create online folder structure, shared appropriately. Understand the demands of the course spec. Recognise their own strengths and weaknesses in preparing for the course. Identify existing skills to build on. Words to learn: Abstraction, decomposition, problem-solving, computational thinking. Quickly write down the most important skills you think are needed for computer Science. Write an explanatory sentence for each one. Discuss your thoughts in a group. Complete the following google form: Click Here!! Thinking about the skills required for Computer Science, you’re going to consider a problem. 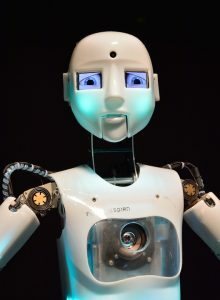 Human beings find it difficult to interact with/trust robots. Why might this be? When you’re talking to a person, what makes you like/dislike them instinctively? How can we make a robot display emotion? What visible components would the robot need? Sketch the “components” on paper. Now create an arrangement of your “components” for each expression/emotion. Easy? Hold on. Now give one of your components to a different person. Your task is to call out an emotion, and each “controller” must arrange the component in the correct position….